Wish: "Please, cure my younger sister’s illness…! Make Ui healthy again! For that…I, will do anything…!!" School: Transferred to Kamihama City University Affiliated School. Connect: We'll be fine since we're together! The main character of the game. Iroha Tamaki is a girl who is looking for her younger sister, Ui, who disappeared at Kamihama city. 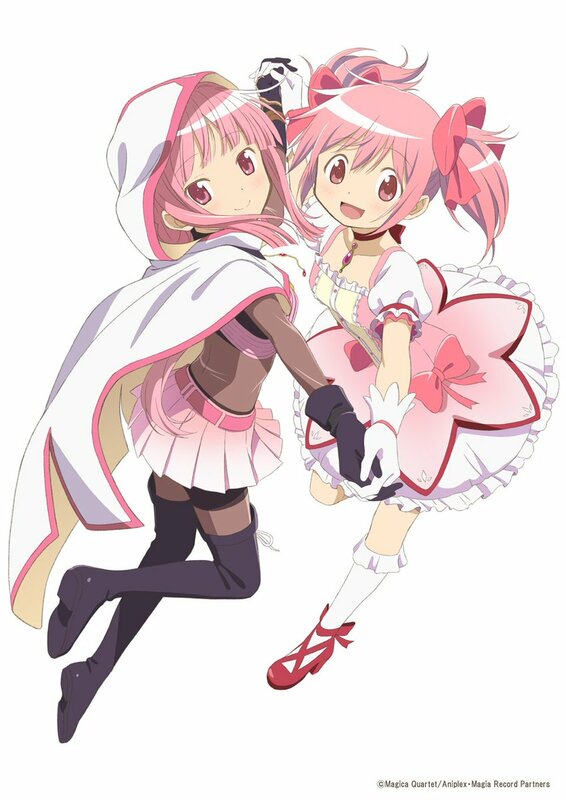 To cure her little sister's illness, she made a decision to become a magical girl. While she is cheerful and serious, she is too careful about her surroundings. "Wait for me, Ui. Your big sister will find you." The Doppel of Silence. Her form is that of a cuckoo. This Doppel is a replica of silence. When her soul gem turns black, Iroha's hair transforms and this Doppel reveals herself. This Doppel, which has a timid nature, silently covers her ears and tries to cover up everything by using a cloth. The Doppel of silence. Its form is a calling bird. The master of this emotion is aware of her Doppel’s pitiful form, but is unable to view it directly. This Doppel speaks of nothing; it wraps everything that it doesn’t want to hear in cloth, and squeezes it to pieces. It is forever searching for something that can fill the empty hole in its chest. Despite how desperately it needed to call out for someone, this cowardly Doppel is afraid to take a direct look at the reality that it hid away with cloth, and its ears remain covered in silence. Iroha goes to Mitama Yakumo, ready to pay Grief Seeds for magic strengthening. Mitama jokes that Iroha has to take off her clothes, but Iroha says she won't fall for that again. As Mitama uses her magic, Iroha thinks she still can't get used to it. She feels like something is throbbing inside her body, and sees glimpses of memories. Meanwhile, Mitama starts talking about food. She then asks Iroha if she saw something weird. Before Iroha can really answer, Momoko Togame arrives. Mitama says she's being rude, but Momoko says since Mitama often makes her act as a lookout, she's basically an employee. Momoko asks how the treatment is going, but Mitama says it's not done yet. Momoko realizes that Mitama hasn't had lunch. As it turns out, Mitama's treatments don't go well when she's hungry. Iroha asks if this is why she saw Hamburg steak. Mitama says that's exactly right, and the three girls go to have lunch. Mitama invites them into the kitchen and starts cooking. Iroha quickly learns that Mitama is not merely a bad chef, but also dangerous. She begs Mitama to put the knife she's holding away. Iroha asks if Momoko can cook. Momoko says she's in charge of cooking at her house, and asks if Iroha can cook as well. Iroha explains she started cooking for her younger sister Ui Tamaki. While there weren't many things Ui could eat, Iroha cooked in order to help her. She says that Hamburg is a dish with a lot of memories for her. Iroha thinks back to when Ui was about to leave the hospital. She asks the doctor if she can bring something for Ui, and the doctor says it's alright. Ui asks Iroha for Hamburg. Later, Iroha makes the steak at her home. Since she has ingredients left over, she decides to bake a cake as well. However, she ends up burning the Hamburg. Once she returns to the hospital, Iroha presents Ui the cake, but then their mom reveals she brought the Hamburg as well. Iroha asks her mother why she brought the Hamburg here, and her mother answers that it's because Iroha went through the trouble to make it. Despite Iroha's concerns, Ui enjoys her food. Back in the present, Iroha finishes telling her friends this story. Iroha says that Ui would always turn her family's frowns into smiles. Mitama exaggeratedly cries, to Momoko's annoyance. Mitama then realizes her meal is burning. When Mitama takes it out Iroha is surprised to see it, but doesn't explain why. Momoko says to dig in, and Iroha should do her best to look for Ui. Iroha thinks Ui was always someone who would make everyone smile. Some time later, Felicia Mitsuki returns to the house she shares with Iroha and Yachiyo Nanami. Tsuruno Yui is also there. It turns out Felicia went to see an exhibit for "Hugegon Ball" (a reference to the famous anime Dragonball), and got souvenir keychains for everyone. Felicia is hungry, so Iroha offers to cook for her. However, Felicia says Iroha's food is flavorless and suggests eating out tonight. The group agrees, and goes to Tsuruno's family's Chinese restaurant. While Iroha and Yachiyo think the food is average, Felicia claims she really likes it. Yachiyo wonders if it's because of the free meals Felicia gets from working there. As they eat, Yachiyo thinks the food's unchanged. Felicia says it's really good, and Iroha nervously agrees. Tsuruno says that her restaurant used to be really famous, and that there are actually famous politicians in her family tree. Felicia starts laughing. She explains it's because even though Tsuruno's family was involved in politics, they're now running a Chinese restaurant. Tsuruno suddenly gets sad and runs off. Iroha scolds Felicia for her words. Felicia is surprised, because when Tsuruno gets mad at her she usually yells. Felicia says she was just trying to be honest, but Iroha claims that saying whatever you want without considering another person's feelings is dishonest. Felicia runs off crying. Iroha is shocked and apologizes to Yachiyo, but Yachiyo admits she felt the same way. Felicia feels bad about Tsuruno getting hurt, and admits she wants to be with her friends. She unconsciously goes to Tsuruno's favorite park, and finds Tsuruno there. Felicia immediately apologizes and tells Felicia she wasn't trying to say her family was lame. She then claims Tsuruno's family is like something from a manga. Tsuruno then starts to laugh. Tsuruno says she really loves Felicia own personal sense, and that she likes Felicia. Iroha and Yachiyo then arrive. Tsuruno apologizes to the girls, and Iroha apologizes to Felicia. Felicia then collapses from hunger. The group decides to finish their meal. Iroha thinks she was surprised by her own lecture to Felicia. Sometime later, Tsuruno and Felicia arrive at Yachiyo's house and are greeted by Iroha, Yachiyo, and Sana Futaba. After eating dinner, Tsuruno invites the girls to a training camp. Felicia explains that Asuka Tatsuki is holding a magical girl training camp at her family's dojo. Yachiyo passes on the camp. Sana thinks that Asuka was pushy and kinda scared her, so she also declines. Iroha says she's not interested. Yachiyo says the "carnivorous group" of Felicia and Tsuruno will go to the camp while the "vegetarian group" will stay and watch the house. Sana imagines Tsuruno and Felicia as cavewomen and starts laughing. That weekend, Tsuruno and Felicia leave for the training camp. As she prepares dinner, Iroha finds she used too much food. Later Yachiyo hurries out of the shower before realizing that there's no-one who needs to use it after her. Sana says that the drama show they usually watch starts at ten, but Tsuruno's not there to watch it with them. The girls watch it anyway, and find it's not as fun without Tsuruno and Felicia. At the training camp, Asuka says the day's training is over and tells the girls they have to make their own dinner. Felicia wonders if Asuka is a masochist for training that hard all the time. Asuka tells her not to whisper behind her back, and she's not a masochist. It turns out Momoko and her teammates Kaede Akino and Rena Minami are at the camp as well. As the girls prepare dinner, Tsuruno accidentally refers to Rena as Yachiyo. Felicia says it's like when a student calls the teacher "mom". Felicia then realizes that after dinner, they don't have to play rock-paper-scissors to figure out who makes tea. That night, neither Felicia nor Tsuruno can sleep, and decide to duel each other. Afterward, Felicia says that if Yachiyo was here she'd be mad. Felicia claims it's good because they can play as much as they want, but Tsuruno asks if she really thinks that. The next day, Iroha, Yachiyo, and Sana expect the two girls to return from the training camp, and decide to prepare hot pot for everyone. As they go shopping for groceries, the girls realize they know exactly what to get for Felicia and Tsuruno. Iroha thinks she knows practically everything about her friends. She believes that all those things are precious to her, like jewels. She wonders if that's what you would call a bond. As the girls return home, they bump into Tsuruno and Felicia. They say they left the camp a bit early because they thought the others would be lonely. The girls leave together to have dinner. Iroha narrates that if two people are gone, then it feels like something's missing. She welcomes them home. Having bought a new swimsuit, Iroha thinks about putting away her old one. However, she is reluctant to do so due to the memories she associates with it. In a flashback, Tsuruno invites everyone to go to the beach. Iroha says she doesn't have a swimsuit. Yachiyo says she saw one when she was cleaning. Iroha says it doesn't really look good on her, and admits her classmates pressured her into buying it. Iroha narrates that when her classmates went to the beach, she stayed home. Yachiyo says that if Iroha is uncomfortable, they should go to the beach another time. Felicia offers to take a look at the bathing suit. Yachiyo says she's being ridiculous, but then Sana says she'd like to see it. Iroha decides to show them the swimsuit. Felicia says it just looks normal, and Tsuruno says it suits Iroha. Sana also says it looks good. Finally, Yachiyo says it looks good on her. Because of what her friends said, Iroha started to think the swimsuit was cute. She realizes that she only hated the swimsuit because her classmates only invited her to the beach to even out their numbers. Later, Iroha plays with her friends at the beach, thinking of making fun memories. Iroha and Sana prepare a hot pot for "Luxury Day", where Yachiyo let's them eat hot pot and ice cream. The girls gather ingredients, but Iroha nearly forgets the ice cream. Sana wants strawberry milk flavor, but worries it's too expensive. Iroha says it will be alright if they get Yachiyo her favorite flavor, matcha (basically green tea leaves). Iroha says she'll try plain vanilla. Later, the girls enjoy the hot pot, and Iroha brings out the ice cream. The others are surprised to find it's high class ice cream. Felicia is overjoyed. Yachiyo is alright with it, since they do need to treat themselves once in a while. Iroha reveals she got Tsuruno grape flavored ice cream, and Felicia cookies and cream (because it looks like a cow). Everyone is happy. Iroha wishes these special days could last forever. Upon returning home, Yachiyo finds the room is so clean it blinds her. Yachiyo wonders if she's entered the wrong house, or if she's dreaming. Suddenly Iroha arrives wearing a maid uniform. Iroha says she wants to pay Yachiyo back for her hospitality. Yachiyo says she doesn't understand the maid uniform, but then realizes that Kanagi Izumi must have suggested it. A flashback shows that Iroha did ask Kanagi how to repay Yachiyo. Iroha explained she borrowed a maid uniform from the cafe Kanagi works at. Yachiyo says she could have just dressed normally since her thoughts are what counts. Yachiyo wants to do the remaining chores, but it turns out Iroha did them all. Yachiyo is moved, but finds she can't relax. Iroha then serves Yachiyo tea and cakes. Yachiyo asks Iroha if she wants any, but Iroha declines since she's Yachiyo's maid right now. Yachiyo tries to enjoy herself, but Iroha's staring keeps her from calming down. Yachiyo gets an idea and tries the cake, calling it delicious. She then asks Iroha to try it. Iroha relents and says she'll have a bite. Yachiyo says that since she ate her master's food, Iroha is fired. Iroha says she was led into it by Yachiyo, but Yachiyo says that having Iroha serve her felt so stiff. She admits she's used to relationships where people understand each other, and asks Iroha to just do things she usually does. Iroha says she understands, and "resigns". She then makes tea for herself and Yachiyo. She bears the same name as the Japanese pangram poem, the Iroha. This poem is regarded as the ABC of the Japanese language, by a certain traditional ordering the first three hiragana, i-ro-ha, and contains every mora of the language exactly once. "Iroha" starts like this: "Iro ha nioedo, chirinuru wo" (色は匂へど, 散りぬるを) - "though the flowers blossom fragrantly, they will eventually fall" - and continued on in this vein, talking fundamentally about the cycle of the seasons and of life and death. It was backed by a hidden message written with the last syllable of each line: "toga nakute shisu" (咎無くて死す) "die without wrongdoing". Together, the poem expresses a strong sentiment of "dying at peace and with honor". It may also refer to Accelle, Blast and Charge also being A, B and C.
Her illustrators is Ume Aoki. The name of Iroha's witch, Giovanna, and the name of Yachiyo's witch, Campanella, may be a reference the famous Japanese novel Night on the Galactic Railroad, who's main characters were named Giovanni and Campanella. Iroha's birthday is the same day that Magia Record officially launched. Image is from an official livestream event on September 1st, 2018. The artist is PAPA. Image is from an official livestream event on September 1st, 2018. The artist is Aoki Ume. 5 turns Yachiyo: "If you keep using stuff like this inner tube, you'll never be able swim, you know?" Iroha: "Y-Yachiyo-san, don't pull on it! It's fine if I can't swim!" Charged Attack Damage Up [IV] Passive Momoko: " 'kay, we can't let Yachiyo-san beat us! Let's go slice up those familiar thingies, Iroha-chan!" It’s ok, we’re not alone, and someday… I wish for you to melt all of that anxiety with this warmth. 5 turns We came across a wonderful place by chance! 5 turns Sana: "Wow...It smells nice, doesn't it Iroha?" Iroha: "Yeah! Are you going to eat soon?" Yachiyo: "Wait!...Not yet. I'll be the one to judge." Tsuruno & Felicia: "Fufufu...Charge!" This page was last edited on 28 March 2019, at 01:45.